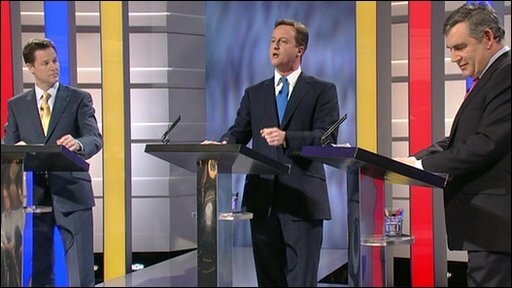 Gordon Brown and David Cameron have clashed over spending cuts, tax and political reform in the UK's first prime ministerial TV debate. The Labour leader went on the attack against Mr Cameron during the historic 90-minute encounter, accusing him of "airbrushing" planned spending cuts. The Tory leader accused Mr Brown of trying to "frighten" voters. Lib Dem leader Nick Clegg said neither of them were being "straight" about the scale of cuts needed. BBC Political Editor Nick Robinson said the biggest impact of the contest will be the insertion of Nick Clegg and the Liberal Democrats into the nation's consciousness but nothing the other leaders said had fundamentally altered the general election debate. The abiding memory of the contest could be "the other leaders saying 'I agree with Nick," he added. Two opinion polls taken immediately after the debate, by YouGov and Populus respectively, suggested Mr Clegg won. 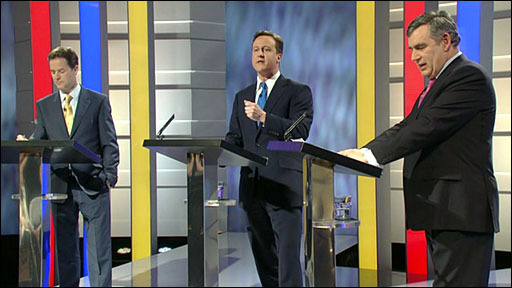 The debate on ITV1 was the first of three over the coming weeks, in the run up to the general election on 6 May. It was a more measured and detailed contest than when the three men clash in the House of Commons, although there were occasional flashes of anger. The audience, which thanks to rules agreed in advance were banned from clapping, sat in silence as the three men bidding to be the next prime minister addressed questions ranging across the domestic scene, from health and education to tax and spending. On the expenses scandal, Mr Brown said he was "shocked" and "sickened" by the revelations. "Nobody should be standing for election at this election who is guilty of the offences that we have seen," he added. Mr Cameron described the expenses scandal as a "horrendous episode", saying people "don't pay their taxes for MPs to abuse the system". He vowed cut the number of MPs by 10%, slash ministerial pay by 5%, reduce the size of Whitehall by a third and bring in a recall system to allow voters to sack their MP. But Mr Clegg criticised his counterparts for failing to take action, claiming Liberal Democrat plans for recall powers and reform of party funding had been blocked by the other parties. Addressing his counterparts directly, Mr Clegg said: "You blocked it. You (Mr Brown) wanted to protect your union paymasters and you (Mr Cameron) wanted to protect Lord Ashcroft in Belize." But Mr Cameron accused Mr Clegg of taking a "holier than thou" approach on parliamentary standards, reminding him that the Lib Dems had taken £2.5m from a man who later went on the run from police. Mr Clegg said that was "years ago" and his party had been cleared by the Electoral Commission. On several issues, including immigration and cleaning up politics, Mr Brown appeared to be seeking the approval of the Lib Dem leader, asserting that Mr Clegg agreed with him. But Mr Clegg replied that he was "absolutely dismayed" at the Labour leader trying to make a show of unity over voting reform after opposing it during his time in power. Mr Brown and Mr Clegg both spoke out against Mr Cameron's plan for an annual cap on immigration, which Mr Cameron said was "simply too high at the moment". Mr Brown, in his opening and closing statements, stressed the need to avoid a "double dip" recession and vowed to protect the NHS, police and schools from cuts. In some of the liveliest exchanges of the debate, Mr Brown challenged Mr Cameron to match Labour's commitment on police funding, telling him: "It's answer time, David." And he challenged Mr Cameron to "be honest" that his plans would cost "thousands of jobs, including teachers". Mr Cameron insisted it was possible to make savings without cutting frontline services, reeling off examples of public sector waste and extravagance. But in his closing statement he attacked Mr Brown for making "repeated attempts to try and frighten you about the Conservative government" and he urged voters to "choose hope over fear". Mr Clegg said he had tried to show viewers there was an alternative to the two main parties. "I know that many of you think that all politicians are just the same," he said. "I hope I've tried to show you that that just isn't true." The Scottish National Party and Plaid Cymru are not taking part in the debates, although the BBC is to hold separate leaders debates in Scotland, Wales and Northern Ireland. Plaid Cymru leader Ieuan Wyn Jones said: "In what was a very sterile debate, not once did we hear the word Wales mentioned by any of the leaders. Indeed much of what they said was irrelevant to our communities." He adds: "The people of Wales and Scotland were ignored tonight - but let me assure you that they won't be ignored by Plaid Cymru." SNP Leader Alex Salmond said: "Over half the debate should have been captioned 'Except for viewers in Scotland'. "It was billed as a historic event but we got was three Westminster politicians looking the same, sounding the same and saying nothing of relevance to Scotland." UK Independence Party MEP Nigel Farage, speaking on BBC One's Question Time, said there was not a "single memorable phrase" in the entire 90 minutes, adding "more people will not turn out at the polls as a result of tonight's debate" and the winner would be the "none of the above party". The debates are bound by more than 70 rules agreed after weeks of negotiations between the parties and the broadcasters. The audience were asked to applaud at the start and end of the programmes, but are not allowed to respond to leaders' answers, with questions being put to the leaders by the presenter. Most of the 200-strong audience in each debate will be picked by pollsters ICM from the local area to ensure a balance of gender, age, ethnicity, social class and voting intention. Sky News will be showing the second debate on Thursday, 22 April, which will look at foreign affairs. The final debate on BBC One on Thursday, 29 April will focus on the economy.